La Verne Online is a top-ranked online school with both bachelor’s and master’s degree programs available through the University of La Verne. These programs are at the forefront of online education and are taught by the University of La Verne’s experienced faculty in a way that is both flexible and convenient. We offer degree programs that can be completed entirely online. La Verne’s distance programs are available to residents in select states at this time. Please visit our State Authorization page to see if your state of residence is available. U.S. News and World Report has named La Verne Online’s bachelor programs as the best in California. Online MBA Report ranked La Verne’s program as the #4 Online MBA program on the West Coast in 2015/2016. La Verne Online combines the high-quality education from the University of La Verne’s regional campuses with the convenience and innovation of online learning. Class sizes are small, which allows for individualized support for students. 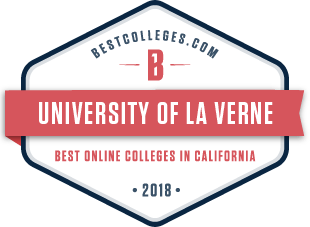 BestColleges.com identified the University of La Verne as one of the Best Online Colleges in California in 2018.